Composer, accompanist and musical director Jess Meeker was born in 1911 in Arkansas City, Kansas. An accomplished musician from early childhood, Meeker accompanied silent films in his hometown before modern dancer and choreographer Ted Shawn discovered him playing for a church pageant featuring a former Denishawn dancer, Ernestine Day. Shawn was planning a new, all-male dance company and invited Meeker to begin work as his composer and accompanist at Jacob’s Pillow in the summer of 1933. 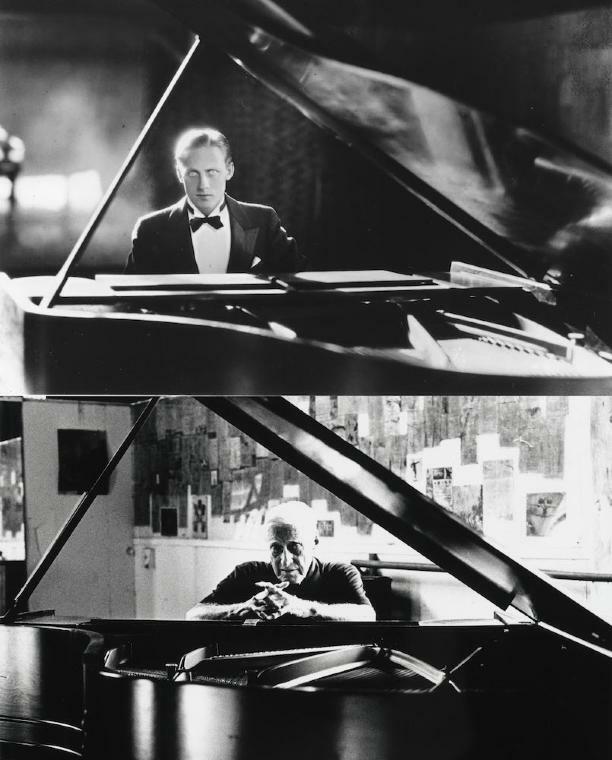 Throughout the 1930s, Meeker accompanied classes and played the piano for all the Ted Shawn Men Dancers performances as well as composing much of the music to which Shawn choreographed his dances. He toured with the company to hundreds of cities across the U.S. as well as to Havana and London. Meeker played at Carnegie Hall on several occasions, and his music was performed by the Philadelphia Orchestra at Robin Hood Dell. Meeker continued his association with the Pillow after the company disbanded in 1940, accompanying classes and performances at the festival. After serving active duty with the Army in World War II, he found jobs as a rehearsal pianist for Ballet Theater and several Broadway shows as well as touring South America with modern dance duo Foster Fitz-Simons and Miriam Winslow. He also accompanied Maurice Chevalier in several night club appearances and, from 1950 into the 1980s, served as the musical director for Steffi Nossen’s Dance in Education Fund in Scarsdale, N.Y. In addition to accompanying many performances at Jacob’s Pillow, Meeker often played in other venues for Ruth St. Denis, Lotte Goslar, and others. He was the onstage pianist for a solo performed by Dame Margot Fonteyn at Jacob’s Pillow in 1973, and he performed his score for Shawn’s “Kinetic Molpai” when the dance was revived for the Alvin Ailey American Dance Theatre in the early 1970s. His last New York appearance was in 1991 when he again played “Kinetic Molpai” for the Jacob’s Pillow Men Dancers program at the Joyce Theater. During the 1980s, he reconstructed many of the Shawn dance scores, some from memory, and recorded the music in synchronization with 50-year-old silent films. He also appeared in an award-winning video documentary, “The Men Who Danced.” In 1981, Meeker was romantically reunited with Peg Easton Seney whom he had dated in the 1930s. They married in 1982 and later moved to Toledo, Ohio, where she died in 1988. The Pillow’s Meeker Garden is a memorial to her. Meeker continued to live in Toledo, where he played a number of piano recitals. He continued to accompany classes at the Pillow up until the time of his death in 1997. [Identification of item], Jess Meeker Collection. Jacob’s Pillow Dance Festival Archives, Becket, MA. As the accompanist and composer to the Ted Shawn Men Dancers from its beginnings in the 1930s, Jess Meeker amassed a collection including hundreds of his original music manuscripts, formal portraits, personal snapshots, personal papers, press clippings and correspondence that trace his development as a composer as well as his professional and personal relationships to choreographer Ted Shawn, choreographer Steffi Nossen, Jacob’s Pillow visiting artists, students and staff at Jacob’s Pillow, until his death in 1997. The vast amount of original manuscript scores he produced, many with copious notations and instructions throughout, reveal his intimate involvement in the development of both Ted Shawn’s, and later Steffi Nossen’s, work. He wrote scores to accompany full-length pieces as well as shorter works geared to very specific warm ups and techniques created by Shawn and Nossen. Interspersed among his music writing folios is published sheet music by classical composers such as Bach, as well as the work of more contemporary composers of the 19th and early 20th centuries. Another significant portion of the collection includes press clippings, interviews, publicity pieces and programs that document Meeker’s work at the Pillow and his tours with the original Men Dancers in the 1930s up to his continuous involvement at the Pillow into the 1990s. Also included are videotapes of Ted Shawn dances, copies of original footage of the Men Dancers, and videotape of The Dance in Education Fund benefit performance, Harrison, NY, April 7, 1984. There are also audio reel-to-reel recordings of Jess Meeker's music used in performance and studio accompaniment. Other materials include personal papers such as contracts and correspondence with Pillow staff as well as financial, military and educational records. The photographs in the collection comprise Jess Meeker's lifetime, from military and formal portraits, to more informal snapshots of gatherings with friends at his New York City apartment, visits to his sisters, cross country travels, and gatherings with numerous staff and dancers at Jacob’s Pillow. Jess Meeker’s framed items include signed photographs of Ted Shawn, Ruth St. Denis, and various principal dancers. The collection also contains several books related to music composition, theory and history. This collection is open for research. Advance notice required for access by contacting the Director of Preservation.